First – the situation. Harper has reduced the size of the government by about 2% of GDP, near as we can tell with the flawed numbers we have (more on that later). All the OECD nations went into deficit after the 2008 financial crisis. All other rich nations then engaged in a balance of spending cuts and tax increases to get back into balance. Except Canada, where Harper cut spending, and then cut taxes as well, and then cut more spending. Thousands and thousands of civil servants have lost their jobs. There is nothing necessarily wrong with that. Canada has long been due for an adult conversation about what services the feds should provide, and how much they should cost us in taxes. But we haven’t had that conversation. What we have had is deception and outright lies. The deception is that services have not been affected. That somehow the government is doing what it did before, just at a lower cost. That fat was cut, but not muscle or bone. The most public example of this has been Veterans Affairs. That situation has become so bad they underspent by over a billion dollars. This did not happen because veterans did not need help, or did not ask for it, but because most access points were closed, and there were too few people left in the department to even talk to vets, let alone process their requests. The services remain in name only; the means to deliver them has been gutted. And these are services that even Harper has said should be provided. We could also talk about Fisheries, where the libraries have been burnt and the scientists fired. Or Transportation (same thing, even after the Lac Megantic disaster). And we all know what happened to Statistics Canada, especially since they had the temerity to tell Harper he was wrong – cut by three quarters or more. How long are the Immigration queues again? Do we know if there are any Food Safety inspectors left at all? Health Canada now takes years to approve drugs that used to take weeks to months. The list goes on and on and on. But we don’t really know. Because Harper has refused to release, even under court order, any details of these cuts. He has refused to say we don’t need these services, and legislate them out of existence, which is what an honest leader would do. Instead he has strangled them behind closed doors, gagged anyone who might talk about it, and fought in the courts to keep the details secret, even from Parliament (which he is required to consult) and the Parliamentary Budget Office (which he set up when he used to talk about “transparency”). The accounts being released do not reflect any sort of reality about what services the government is actually providing. Harper, Mulcair and Trudeau are fully aware of this. Ottawa is so broken and hollowed out even Harper could not hide it for much longer. The fat’s gone, the muscle’s gone, the organs are clogged and many bones are broken. Amputation is next, but we get silence. Because there is a huge fight coming, and no one wants to harm their electoral chances by talking about it. By 2016, if taxes remain where they are, a number of services will have to be shut down so the remaining ones can actually be delivered. Or taxes will have to go up to pay for the services that are already legislated to be provided, but are not. This will cause a huge fight about which services should go, which should stay, and what new ones we should have. That would be a proper political fight, if it’s had in the open, with transparent numbers, and with actual discussion and input from all the affected parties. An election would be a good time to have it, or at least to get some direction from potential leaders about what they would do. But that’s not what we’re getting. We’re getting an “everything’s fine, stay the course” from Harper, which is an outright lie. Mulcair says he’ll raise taxes, but add new services that arguably cost more than the taxes will raise, with no money to reinvest in currently gutted services – not an outright lie, but a huge omission. Trudeau likewise talks about short term deficits to fund new programs, but evades any discussion about returning funds to existing ones – again not quite a lie, but hiding a big truth. None of them are saying which programs they would cut in their entirety, or how substantially taxes must rise. The only hope of having this turn out in a way acceptable to the largest number of Canadians is to have the discussions in the open. And since Harper has demonstrated over and over that he will never discuss anything openly, he can be expected to just cut what his ideology tells him, regardless of what is best for the country. Only if he is defeated outright, or in a minority government, will the public accounts be made public again. And only when we know how bad it is can we decide what to do about it. This issue – the appropriate size of the government and the taxes required to support it – is THE economic issue of the election. In Canada’s situation, the government has very limited ability to directly affect the wider economy, regardless of what these politicians say. You can subsidize this, and regulate that, but unless you go hog wild, these things only have effects at the margins. But what politicians can affect is the single largest employer in the country, and the single largest source and application of funds. Keeping the government house in order WILL affect the wider economy. So I will not be voting for Harper, as I don’t think any one person should make those decisions by themselves. 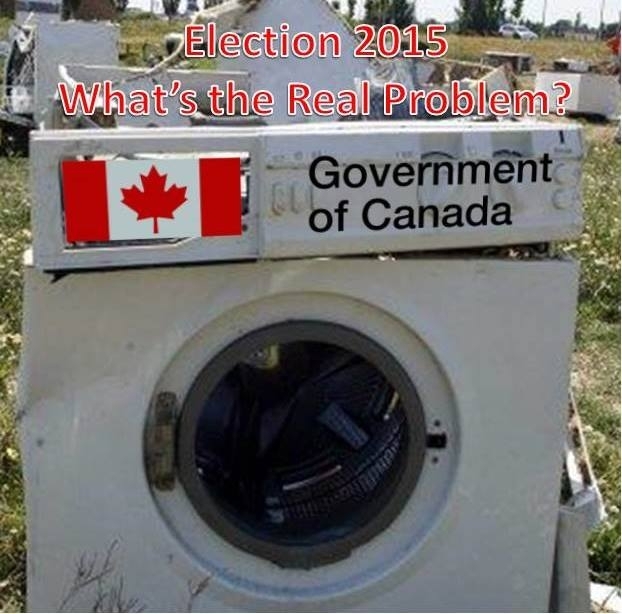 I think either Mulcair or Trudeau will face this problem with a better outcome for Canadians. So mark me down as an AnybodyButConservative voter.